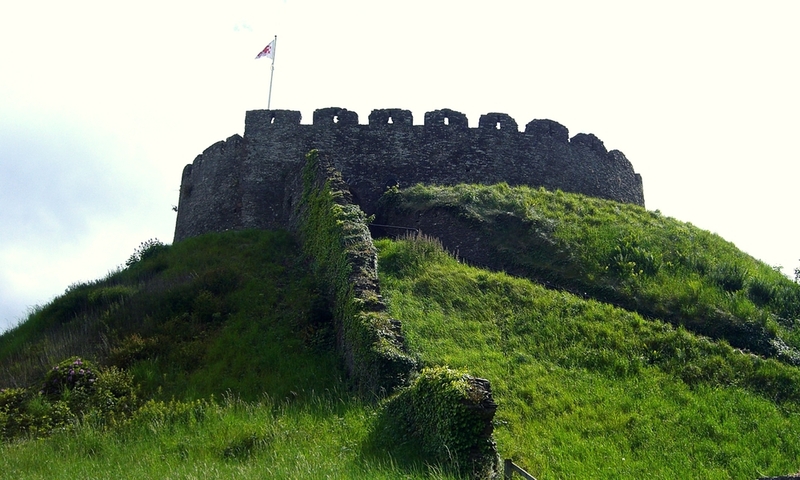 Totnes Castle is one of the best preserved examples of a Norman motte and bailey castle in England. It is situated in the town of Totnes on the River Dart in Devon. The first castle on this site is believed to have been built by the Breton Juhel of Totnes who was one of William the Conqueror's lieutenants. The feudal barony of Totnes was granted to him in 1068, and in order to cement his control over the area he constructed a fortification and founded Totnes Priory within the town. By 1326, the castle had fallen into ruin and was under the control the de la Zouch family. During this period a royal order was made for the repair of the fortifications. As a result, the castle was re-fortified with a new shell keep, using Devonian limestone and red sandstone, a stable was constructed and a constable appointed. Following the Wars of the Roses it once again fell into disrepair. The castle was occupied for a period during the Civil War but saw no notable action. The castle occupies a commanding position atop a large hill above the town, and guards the approach to three valleys. Since 1984 the castle has been under the stewardship of English Heritage. The castle is a scheduled monument and a Grade I listed building.